Is there a way I can set an area, bigger than one block, to teleport players from? I'd like to randomly teleport people that are within this area to two or more destinations. I'm making a minigame in which players all start in a hub, and a command blocks picks one of the players in the hub area randomly and teleports them to either the blue team or red team side. My problem when trying this was that it would teleport people no longer in the hub area, making it so that a person on the blue team could randomly get swapped to the red team or from red to blue. How can I make the command only target people in a certain area? I'm currently on Minecraft 1.10.2 for PC. respectTeams: True or false. When true, targets on the same team will be teleported to the same location. 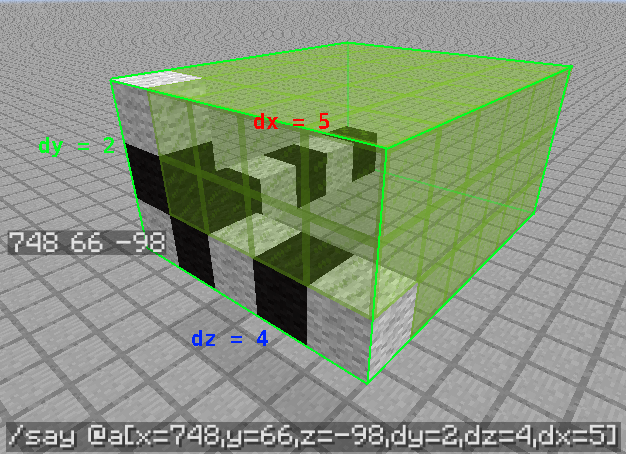 This will teleport all players to random locations, but at least 1 block away, from x = -10 and z = -10 to x = 10 and z = 10. This command will teleport a random player that was less then 10 blocks away from XYZ 0, 60, 0 to a random location within 5 blocks of X, Z 100, 100. Which would TP anyone within 15 blocks of that point to X1 Y1 Z1 (set this to the red/blue team's side). With the cuboid selectors, your starting point should be the corner of the cuboid with the lowest coordinates on all axis (so lowest north-western). These are more complicated than a radius selector, which you might want to stick with, but will allow you a more accurate area if your hub is cuboid. Use the radius target selector. You should use something such as @r[r=ENTER HUB RADIUS HERE]. Use this target selector in a command, eg. /tp. Hook it up to a clock that starts when pressed from a button and it should teleport everyone to different team location one by one. Use multiple command blocks of you want more destinies. How can I teleport one player to a random other player using a potion as the trigger? How to a show message only once? Is it possible to put colored armor on a player using a command? How do I place a red block under a red team member who is on a white block?